As a recent college graduate seeking a great career opportunity, one of the toughest obstacles to overcome is a lack of experience. But how do you gain experience unless you have an opportunity to obtain a professional job and show what you’re capable of? For many young graduates, this is an all-too-common challenge that is tough to overcome. What if you could find a career opportunity that would help you kick off a great recruiting career by immersing you in an elite training program for 3 months during which you will not only learn how to become a successful recruiter but also learn all aspects of the recruiting business? What if you could parlay this program into a career path that might also lead to sales and/or management? The program will also expose you to the various industries and services we focus on, including IT Staffing, Creative Services, Biometrics/Data Solutions, Life Sciences, Agile Consulting, Government Services, and Workforce Management. 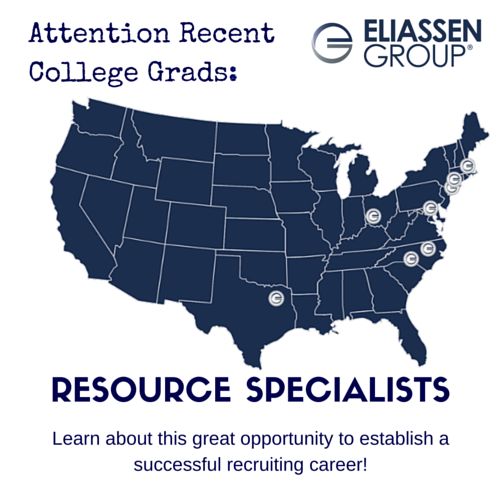 If you successfully complete the program, you will secure a recruiting position in one of Eliassen’s locations (see below).